Notes to the Leader: This study looks into the Antichrist. Other than Hollywood, the subject of Satan and the Antichrist are not discussed much. However, there are every day examples that remind us, When Christ comes, how will we know its really Him? 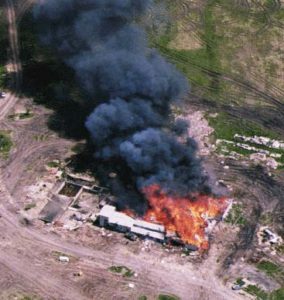 To set the stage for the discussion, the Branch Davidians and Waco, Texas are used as examples. Feel free to substitute any current event that parallels the Davidian example. Be aware that events like Waco polarize people and can bring forward extreme opinions or passions. Approach these examples with a careful and non-judgmental presentation. You can substitute events if there is one you believe can be as effective to stimulate discussion. Do you remember the events in Waco, Texas with David Koresh and his followers? Background: David Koresh was born Vernon Wayne Howell in Houston, Texas in 1959 to a 15-year old single mother. He never knew his father and was raised by his grandparents. In his late night conversations with FBI agents during the siege, Koresh described his childhood as lonely. He said the other kids teased him and called him “Vernie.” He was dyslexic, a bad student, and dropped out of high school. However, he had musical ability and a strong interest in the Bible. By 12, he had memorized large tracts of it. When he was 20, Koresh turned to the Church of Seventh Day Adventists, his mother’s church. But he was expelled for being a bad influence on the young people. Sometime during the next couple of years, Koresh went to Hollywood to become a rock star but nothing came of it. Instead, in 1981 he went to Waco, Texas where he joined the Branch Davidians, a religious sect which in 1935 had settled 10 miles outside of Waco. At one time, it had more than 1,400 members. Koresh had an affair with then-prophetess Lois Roden who was in her late sixties. The two travelled to Israel together. When Lois Roden died, a power struggle began between Koresh and Lois Roden’s son George. For a short time, Koresh retreated with his followers to eastern Texas. But in late 1987 he returned to Mount Carmel in camouflage with seven male followers, armed with five .223 caliber semiautomatic assault rifles, two .22 caliber rifles, two 12-gauge shotguns and nearly 400 rounds of ammunition. During the gunfight, Roden was shot in the chest and hands. Many Branch Davidians, led by David Koresh, died in a controversial, ill-advised U.S. government operation on April 19, 1993. Several survivors are serving time in prison. Currently, there are a number of Branch Davidian factions, such as the ones led by Clive Doyle and Renos Avraam. Surviving Branch Davidians have testified that they considered David Koresh to be God incarnate. Many view the Davidians as a sect (in the sense of ”splinter group”) of the Seventh-Day Adventists movement. Theologically, the various Davidian groups, of which Branch Davidians is best known, are considered cults of Christianity. How do events such as those at Waco impact your view of religion? The answers here are going to be wide ranging and personal. There will be no immediate correct answer at this point in the study. Discussion should be used to create a framework for looking at God’s words on the subject. They may take the form of acceptance in the sinful nature of man. Waco may stir contempt and even hatred for our government and how the FBI handled this tragedy. Twenty five children died in a fire resulting from the FBI assault. Some will view David Koresh as a modern day Satan and others may believe he and his followers died in an ultimate act of faith. Do you think that David Koresh represents a portrayal of the Antichrist? Why? Biblically, the concept of the Antichrist is real. God’s word tells us that their will be those who claim to be Christ or God that will come to confuse and and lead astray. How can we tell if someone like David Koresh is who he claims to be? Look at his life. Ask the question, “Does it reflect the characteristics of Christ? In such an analysis, David Koresh is only making a shallow claim of being Christ. Read Mark 13:6 to your group. When Christ does come, how will we know Him? By His characteristics: Peaceful, compassionate, sensitive to our discomfort and pain, without sin, humble, not prideful or boastful, loving, patient, kind, etc. Please expand this list into a mental image of your Savior. Does this image fit David Koresh? The images do not overlay well. How do we learn the characteristics of Christ so that we will not be fooled? Through the study of Scripture to have the Word of God firmly planted into our hearts. However, the responsibility of interpretation rests with us so that we are not easily confused. We are to seek God’s word through multiple channels so that the Holy Spirit’s work can provide us the discernment necessary to know the truth. What would some of the “channels of learning” be? Read Revelation 19:20 and Revelation 20:10 to your group. One interpretation is that the Antichrist is a supernatural figure. Read 1 John 2:18-22, 1 John 4:3, and 2 John 1:7 to your group. Another view could be that it is the general group of people positioned against Christ. Why is knowledge of the Antichrist important to each Christian? The risk of being deceived is great. Read Matthew 24:24 to your group emphasizing “even the elect”. Have someone in your group read 2 Thessalonians 2:1-5. Paul makes two requests of his readers. What are they? Do not be upset by false teaching alleged to have come from himself. Do not allow anyone to deceive them regarding the coming of the Day of the Lord. Why is it so important to preserve the integrity of the Scriptures? Do you think that the meaning of the Scriptures is under attack today? Man’s intellect can be Satan’s greatest tool. When we allow ourselves to rationalize and analyze to such an extent that God’s original intent is distorted, we have opened the door for our own deception. Read 1 Corinthians 15:1-4 and Galatians 1:8-9 to your group to close on the last point. Rapture will occur during the period of Great Tribulation. Our rescue [1 Thessalonians 1:10]. Being alert [1 Thessalonians 5:6-7].he purpose of the Rapture [1 Thessalonians 5:9], not to suffer wrath but to receive salvation. Paul is assuring each of us that the Day of the Lord means glory not judgment. To the Thessalonians, he was assuring them that Rapture did not miss them. The “rebellion” Paul describes is more a part of the judgment that will occur in those who are not with Christ. How many places will be left after the Great Tribulation? Only two. Mankind will be forced out of the middle and the choice will be taken from them. If you consider the prognosis of eternal separation from God as someone’s lot in an eternal life, it becomes easy to see why they will rebel. This is why we must guard against being mislead and be active in helping others prepare themselves. Whether we are alive during this period is not the question. Surely our families, friends or at least their heirs will be part of this struggle. Have someone in your group read 2 Thessalonians 2:6-12. Paul refers to a “restraining power” keeping the Antichrist from taking its final form. What do you think the restraining power is? Civil government such as the Roman empire at the time of Paul that maintained law and order. The Jewish state in Palestine that prevented Roman government from exercising the full force of its godless power. The preaching ministries of Paul and the other apostles. A supernatural figure [Revelation 9:1, 20:1]. Satan himself who is biding his time and waiting for the right moment. The Holy Spirit, acting now as the convictor of sin, who will be taken out of the way to allow the delusions (v11) to take full hold. The Church, which after the Rapture, will not be present on earth. Use your whiteboard or easel. Build a list of responses for the next question. Can you describe a world without conscience or constraints holding back sin? What ever your descriptions, it will not be a pleasant place from a Christian’s point of view. Have someone in your group read 2 Thessalonians 2:11-12. To what extent does our society recognize God in its thinking? How much importance is attached to moral and spiritual considerations in the formulation of public policy? How much recognition do the “opinion-makers” of our day give to the truth as revealed in Christ and the Bible – and to the necessity of measuring human affairs by that standard? When the lawless one (Antichrist) is fully revealed, humanity will have a heyday. God and His truth will be ignored – for a time. However, Christ wins in the end [2 Thessalonians 2:8]. Paul was telling the Thessalonians that they should not be concerned with when but with their lives while they were waiting. Have someone in your group read 2 Thessalonians 2:13-15. Something received from someone and handed down to another. Have someone in your group read 1 Corinthians 15:1-3. Based on these verses, what was Paul’s tradition? Read 2 Timothy 2:2 to your group. What should our personal responsibilities be as well as those of our church regarding the Gospel’s message? Not only to pass it on but to be sure that we instruct others in the “tradition” of our faith so that each generation will be strong and not be fooled by the Antichrist. Read 2 Thessalonians 2:16-17 to your group. Paul concludes with a benediction. What is Paul praying for? Our encouragement and strength. We are to take comfort in the fact that although this will be a time of great tribulation, God is on our side through it all. The Antichrist will be a powerful, supernatural foe of all Christians. To learn that we must hold on to the teachings of the Word of God and that Christ will triumph over the Antichrist.